A Vogue Hommes September 1986 #92 magazine with Sylvester Stallone on the cover that was erased and (re)inscribed by approximately 260 people in the years 1999 to 2004. Over those five years various people were asked to completely erase, with a rubber-eraser (by choice, Staedtler 'Mars Plastic'), one of the 246-odd pages of this intact and out-of-date French men's fashion magazine. They were also asked to anonymously write in pencil on their erased page both the time it took them to do this, as well as whatever monetary value they currently received in paid work for their time, with the latter translated into an hourly rate, or multiple rates where applicable. (NYT please note: no one was paid for their time). The sum of these literal and symbolic expenditures gave each page a nominal value that, when added to that of all the other pages, established a value, of sorts, for the work as a whole - 267 hours 49 minutes and 5 seconds... valued at AUD$11,349.18.... The front and back covers of the magazine, though noticeably worn by years of scuffing, remain unerased. 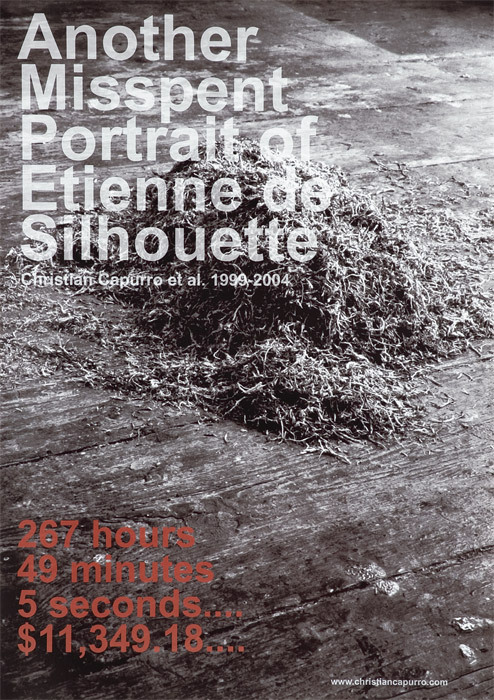 Since 2004 this project has taken different forms on the occasions of its public presentation: Another Misspent Portrait of Etienne de Silhouette, Melbourne (2004/05), Think with the Senses - Feel with the Mind. Art in the Present Tense, Venice Biennale 52. Exhibition of International Art, Venice (2007), Behind the Image | The Image Behind (on covering and uncovering media), STUK Kunstencentrum, Leuven (2009), and a three-person show at the Simon Preston Gallery, New York (2009/10). The mass-erased and (re)inscribed magazine, which is the material touchstone of the project, has been staged in conjunction with the following: a 'response' program presented by invited contributors involving talks, discussions, performances, and other idiosyncratic productions, generated in response to the work itself or to the wider social and/or artistic contexts of its production and subsequent dissemination (nine locations in Melbourne '04/'05 and six on/off-site events in Venice '07); an installation of affiliated works, plus an archive (Venice '07, Leuven and New York '09); and, a shortwave broadcast (Leuven '09). The transcripts of the site contributions in 2004/5, including an artist text, are to the right on the 'AMPEdS' page sidebar (or at this link). Those from the 2007 Venice Biennale of Art presentation are also available online and can be accessed here. Information, including sound clips, related to the project's February 2009 staging in Leuven, where the 'response' program took the form of a twice-daily shortwave radio broadcast, can be found at the Leuven sidebar link or by clicking here. Another Misspent Portrait of Etienne de Silhouette is now in the care and collection of the Museum of Contemporary Art, Sydney. Its first staging there, in the 2014/15 exhibition Taking It All Away: MCA Collection, saw the addition of new material to the archive, the co-participation of the artist Chris Bond, and the continued elaboration and play of the 'response' program. The 2004/5 stage of this project was generously supported by the City of Yarra, Click Systems, West Space, and Gertrude Contemporary Art Spaces where I was a studio artist in 2003/4. For the 2007 Venice Biennale presentation the Venice Biennale organization, in conjunction with the Australia Council for the Arts, funded the realization of the work. Additionally, in Venice the project was aided and abetted by important and timely contributions from a number of generous individuals whom I dearly thank. In 2009 STUK Kunstencentrum funded the work to be produced in Leuven and supported it without hesitation, as did the Simon Preston Gallery in New York for their exhibition in that same year. A big cheer for Breenspace Gallery and the supporters within the Museum of Contemporary Art, Sydney, who made its acquisition in 2014 a reality. Finally, my gratitude and thanks extends to all those people - so many of you - who have been involved in the various stages of the project, supported it on its journey and made it what it is.